CVS Health Daily Facial Moisturizer with Broad Spectrum SPF 15 Sunscreen protects against the sun's harmful UVA and UVB rays to help prevent sunburn. 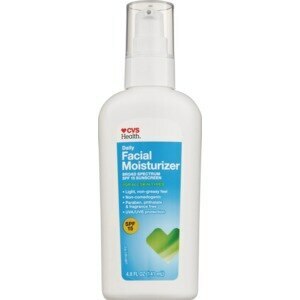 CVS Health Daily Facial Moisturizer with Broad Spectrum SPF 15 Sunscreen is a lightweight formula that hydrates and nourishes while protecting against the sun's harmful rays, with no greasy feel. Perfect for all skin types.